* SIOP, IPSO and PROS Members: in order to apply for this category, please ensure your membership is approved and fees are paid for 2018 before you start the registration process. Registration will not be confirmed otherwise. Important! 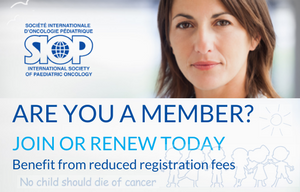 In order to benefit from SIOP Membership reduced rate – please apply for membership at least 5 working days prior to registration deadline. *** SIOP Member- Young Investigators aged 39 or less. ****Students/Residents/Fellows-In order to benefit from the special fee, a submission of your status confirmation (approval letter signed by the Head of Department or copy of your status ID) must be uploaded during the online registration. Additional 30 USD admission is required. Cancellations received up and including July 31, 2018 – full refund. As of October 24, 2018 – no refund will be made. Note: in case of cancelation at any stage, Bank transfer handling fee (30 USD) will not be refunded - applicable to Bank Transfer payments only.